Climate change has been a pet interest of mine for many years. I read and save news articles about global warming, pollution, oil spills, factory farming, and the effects we are having on the natural world... dead zones, species extinctions, new diseases, death and destruction all around. I've not written anything here in my online journal, mostly because it's all very disturbing to me. And overwhelming. 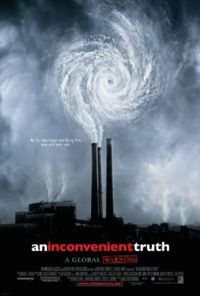 Significant Other and I finally got around to watching Gore's An Inconvenient Truth last night. I thought I would be excessively annoyed because I knew Gore never mentions the fact that going vegan is the best thing you can do for the environment. Not only is it the easiest and cheapest thing, it also has the biggest impact. But anyway. After a few scoffs at the "moral imperative" at the beginning of the movie, I did get into the spirit of the documentary. I enjoyed it and fully recommend it. A thing that Gore mentioned in the movie that caught my attention... People learn about global warming and they skip over "what can I do to help" and go straight to despair. And then he shows a graph where a bunch of little things add up and put us at pre-70s CO2 emissions. In the meantime, they say, we must change our approach to managing and using these ecosystems, particularly for fish stocks. "The most prudent course of action is to begin to think differently about what is happening," said Dr Luchenco. Um, yeah... "thinking" is NOT a course of action. Putting a halt on fishing, fish farming, trawling, and eating sea creatures is a course of action. Fishing Hurts, it's a PETA site, but the information is accurate. If you eat sea animals, you are supporting the most environmentally destructive of all meat industries.